Each topic has 10 pictures (Beginner) or 20 pictures (Intermediate) with their accompanying written texts and spoken English recordings. There are 56 Beginner topics and 58 Intermediate topics to choose from. All the topics are free to use. They are suitable for adults, students and children starting to learn English as a second language. 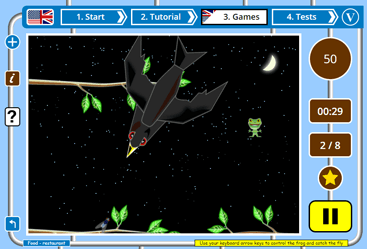 English Activities is a free online resource consisting of English lessons, English games and English tests to help both adults and kids studying ESL & EFL English. See the Help box below for instructions on how to select the first EFL ESL topic you wish to study. The language is beginner ESL EFL English and consists of words, simple phrases and short sentences in the first person present tense. Start by choosing a topic on this page. Then you will do the English lessons to learn the language for your selected topic. Once you have done the English lesson, it is time to practice what you have learned using our fun but simple English games. 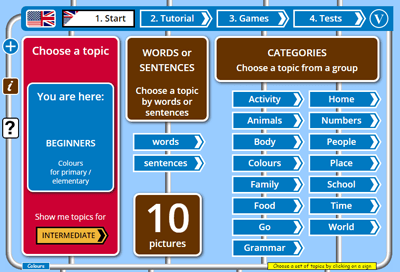 You start English activities by choosing the topic you want to learn or revise. Our English topics are 10 pictures (Beginner topics) or 20 pictures (Intermediate topics) each with an accompanying written text and spoken English recording. To choose your level, use the button at the bottom of the red sign - click on INTERMEDIATE to switch to Intermediate topics, or, if you are viewing the Intermediate topics, click on BEGINNER to view the 10 picture beginner topics. You can now choose your specific topic in two ways - by whether its language is composed of words or sentences or by category. The learning categories are Family, People, Home, Body, Animals, Activity, Food, colours, School, Place, Go, World, Time, Numbers and Grammar. When you click on one of the category signs, all the English topics available will be displayed with a short description and a sample picture. Click on any topic and the pictures will load for you to see. Now you can select the "Start the lesson" button to start the for this topic, or play some of our with this topic if you prefer.